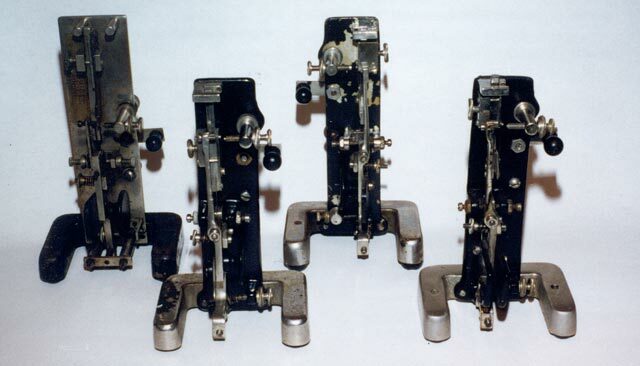 These Four Vibroplex Vertical Keys exhibit different versions of this rare key. Gil Schlehman has been collecting Telegraph Keys for many years. 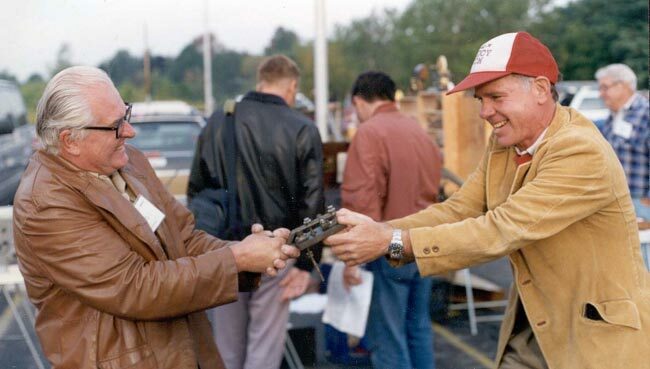 He specializes in Semi-Automatic and Automatic Keys ('bugs') but he has also acquired outstanding examples of Early Landline, Wireless, Military, and Paddle Keys. This CD displays his collection in a series of 383 labeled high resolution color photographs that can be viewed in linear pages dedicated to each category of key. Each picture can be enlarged to allow study of fine details by simply clicking on the photo. In additon, a total of 545 Telegraph Patent Drawings, Advertisements and Articles are included for historical and reference purposes. Clicking on the items in the index of this CD will lead you into the various sections. NOTE:A link to corrections and updates for this cd will be posted on the internet at the top of the www.w1tp.com page in the section devoted to the announcement of the Gil Schlehman Telegraph Collection CD. There are 6 large picture-filled pages dedicated to each major type of key. The keys are presented on each page in alphabetical order according to their most commonly used name. The file name is given under each picture to help you locate it on the disk if you should want to examine it more closely. You may use the 'search' feature of your browser ( edit/find-on-this-page ) to research other names, manufacturers, and countries of origin. You may also use the 'print' feature to print the photos. This also applies to the following sections. Another indexed section of the CD is dedicated to listing telegraph patent information compiled by Gil Schlehman. This section is useful in helping to find a specific patent. This section can be searched or browsed and it includes a handy listing of the dates of issue of American patents. A section of the CD shows 127 interesting and sometimes amusing telegraph bug and related patent drawings in a large easily scrolled page. A section of the CD shows 227 interesting and sometimes amusing telegraph patent drawings in a large easily scrolled page. A section of the CD shows 190 Telegraph Key Advertisements and pages of information in a large easily scrolled page. Although all the pictures and text are copyrighted, you may use any of them for your own personal applications including public lectures and demonstrations. If you wish to use them in publications or websites or offer them for sale to the public in any form, you must contact Gil Schlehman at the address given at the bottom of this page. Please also see the disclaimer of warranty. This has been a brief SAMPLE of the first page of the Gil Schlehman Collection K9WDY CD-ROM. The price of this CD is $ 15.